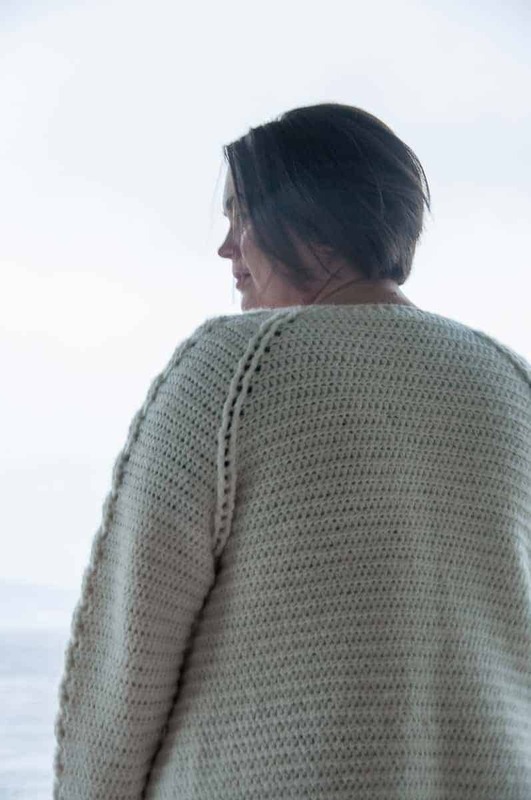 You’re going to love the crochet Nivis Cardigan, because it’s such a beautiful addition to your wardrobe. 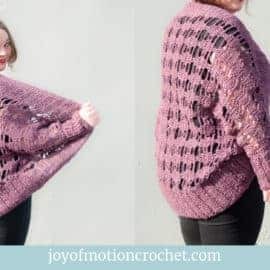 This free crochet cardigan pattern is also a great introduction to crocheting raglan with cables garments, because it is so pretty. 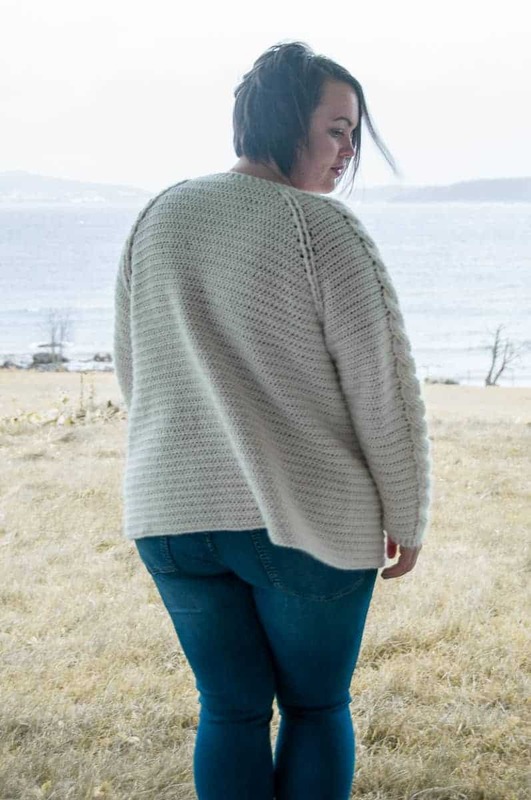 Next, it is also an amazing cardigan for fall & winter, because it is so warm & cozy. 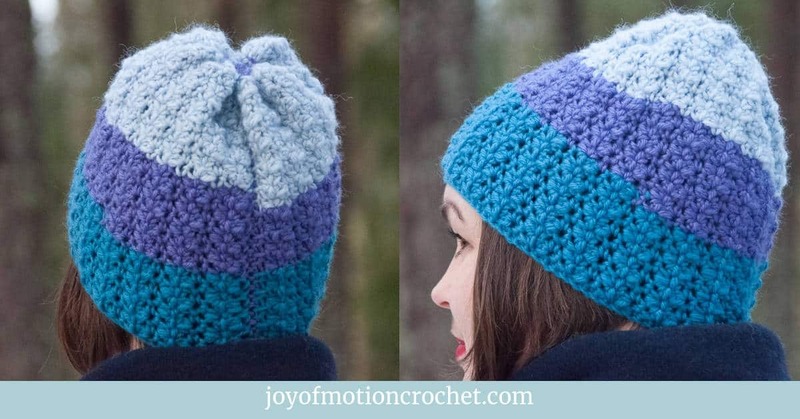 Wear it with jeans & customize it with your own choice of yarn colors. 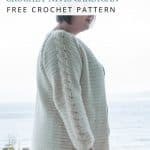 This crochet pattern comes in 9 sizes, & will fit both petite sized, regular & plus sizes. 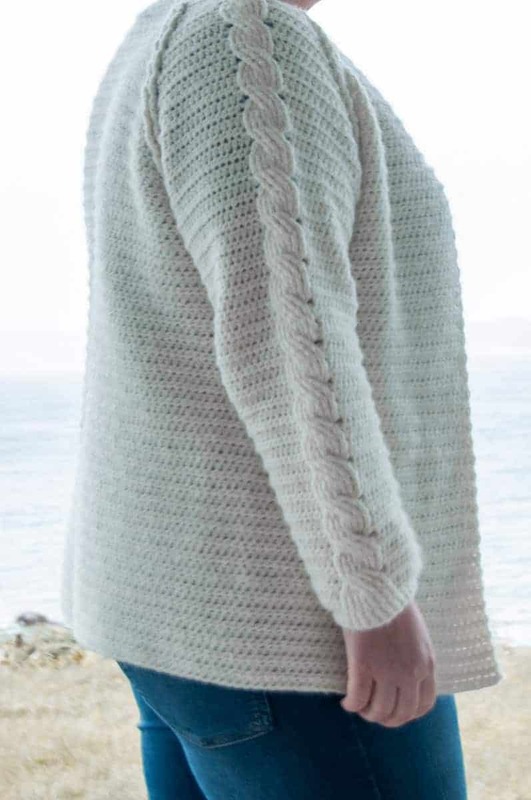 For the crochet Nivis Cardigan the suggested yarn is from Wool and The Gang. 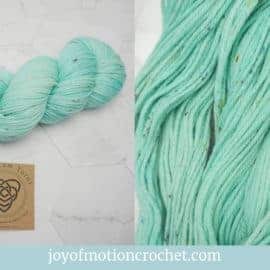 This amazing yarn is called Feeling Good & comes in a lot of beautiful colors. 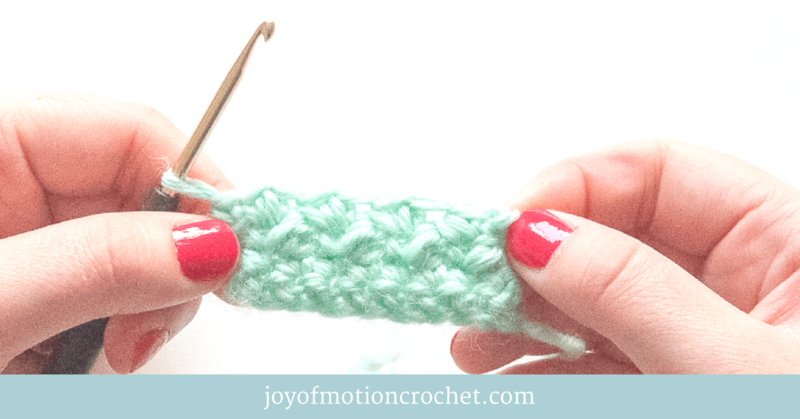 What’s especially great about this yarn is how soft it is. 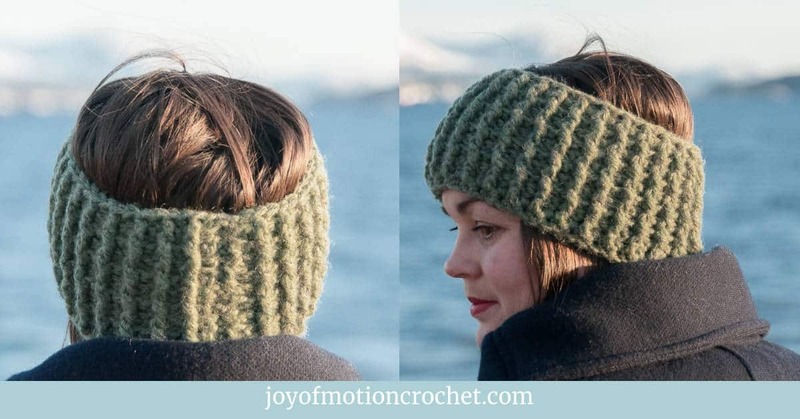 Which makes it impossible to make anything that isn’t super cozy & great to wear. 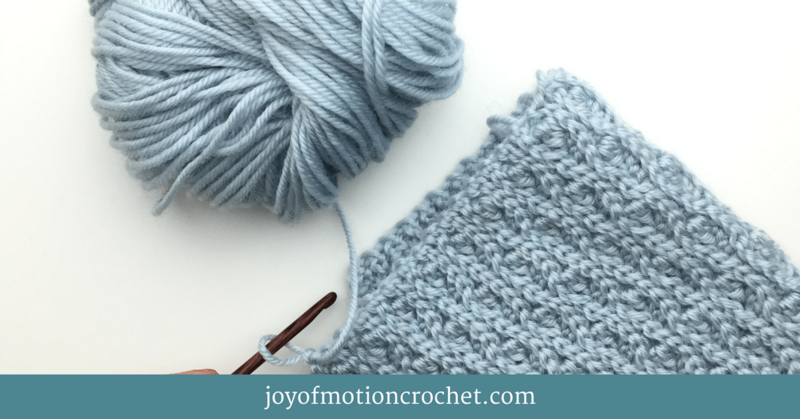 The yarn is made up of Baby Alpaca 70% / Merino 7% and Nylon 23%. 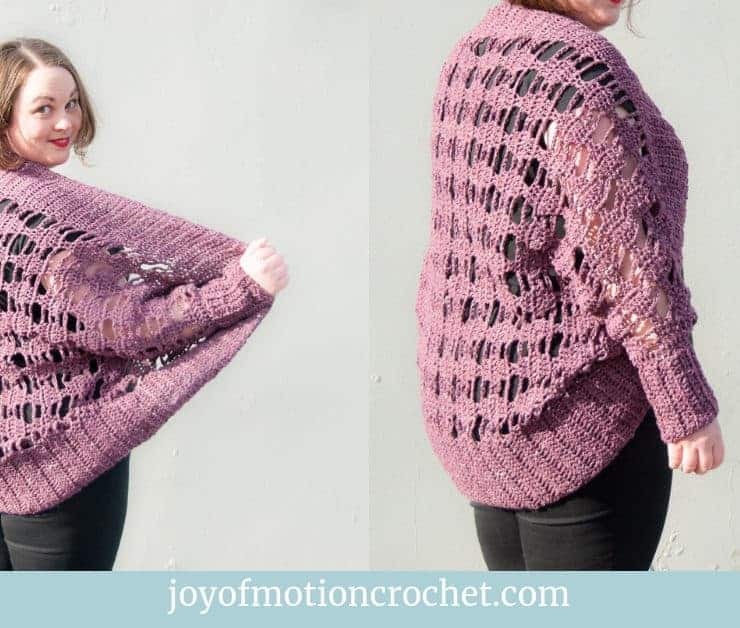 Have you ever tried the Feeling Good Yarn from Wool and the Gang? 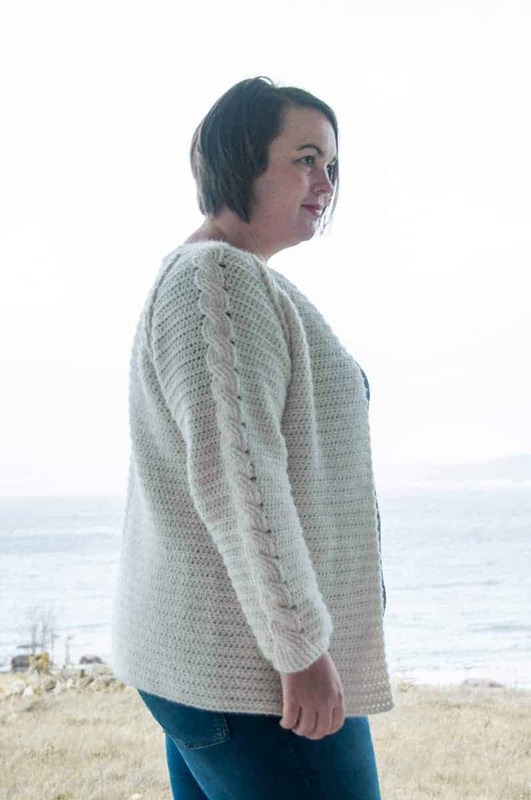 Well, it makes the coziest & most cardigan ever! 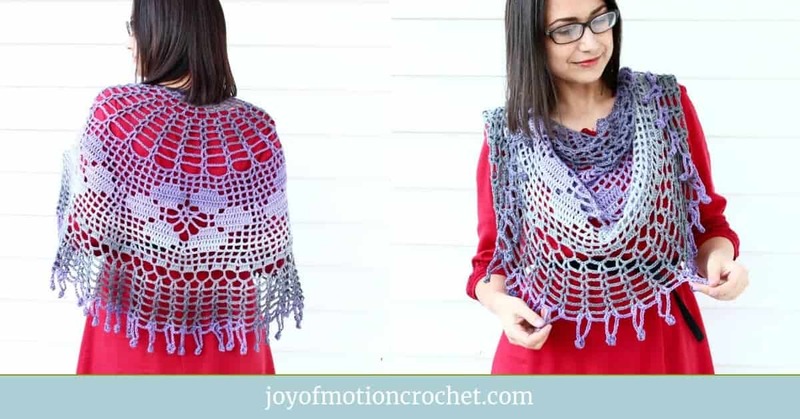 It’s soft & super cozy to wear, but I also love that this yarn is great to crochet with. 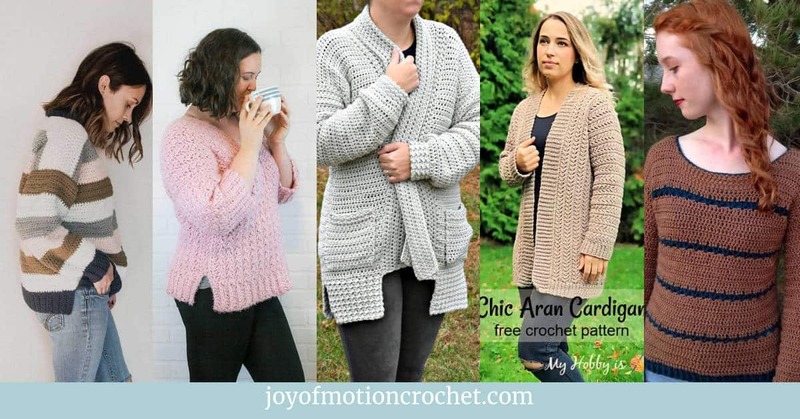 Since you like the crochet Nivis Cardigan, these might interest you too? 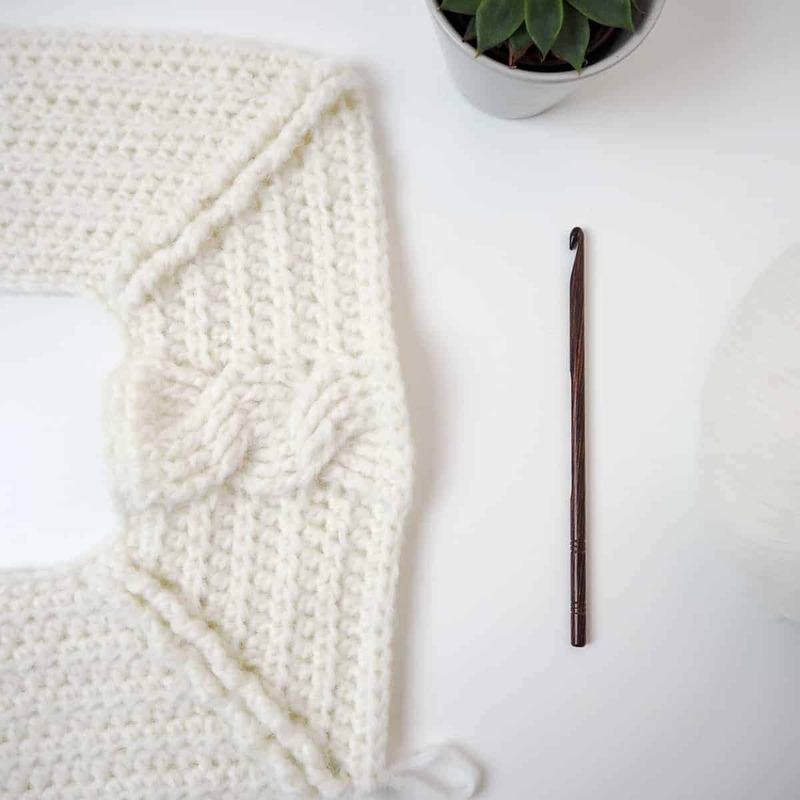 The crochet Nivis Cardigan is the perfect cozy garment for your wardrobe, & let’s fill it with crocheted clothes. 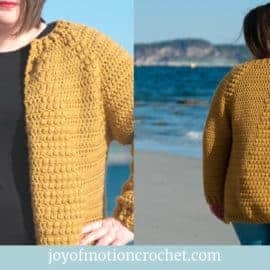 To crochet this cardigan you have to have a bit of crochet experience since the skill level is intermediate. 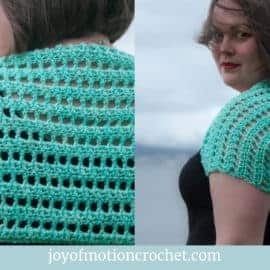 However I would absolutely say that if you’ve crocheted a few projects already, this might still feel like a rather easy project, especially if you’ve tried crocheting cables. 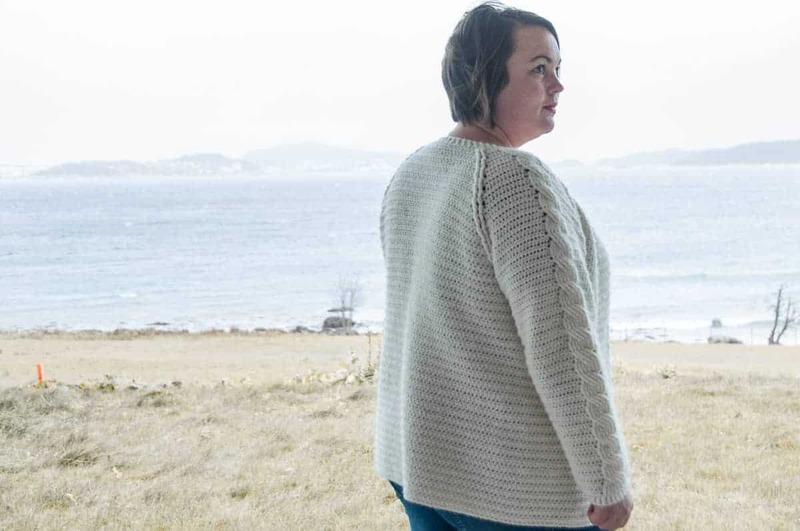 The crochet Nivis Cardigan comes in 9 sizes from XS – 5XL & there’s also suggestions on how you can adjust it to fit you perfectly! 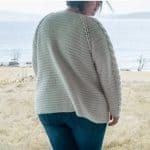 Wool and the Gang – Feeling Good. 4 medium yarn, worsted yarn. 13 stitches & 12 rows per 10 cm / 4”. 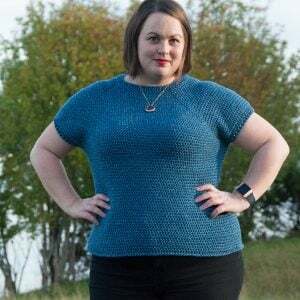 This pattern is written for 9 sizes, where the numbers for the different sizes is given in parenthesis like this: XS (S) M (L) XL (2XL) 3XL (4XL) 5XL. If just one number is given, it applies to all sizes. I recommend that you highlight or circle the size you’re making before you begin, to make the pattern easier to follow. 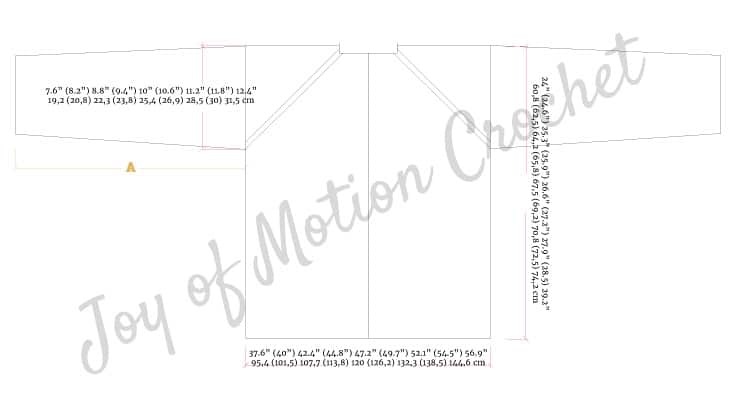 Size adjustments are added under “Size & Measurements”. 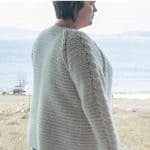 The 8 stitch wide cable on the yoke & arms will be made using the row repeats listed in the stitches you will need section. In the instructions you’ll only find the word “cable”. 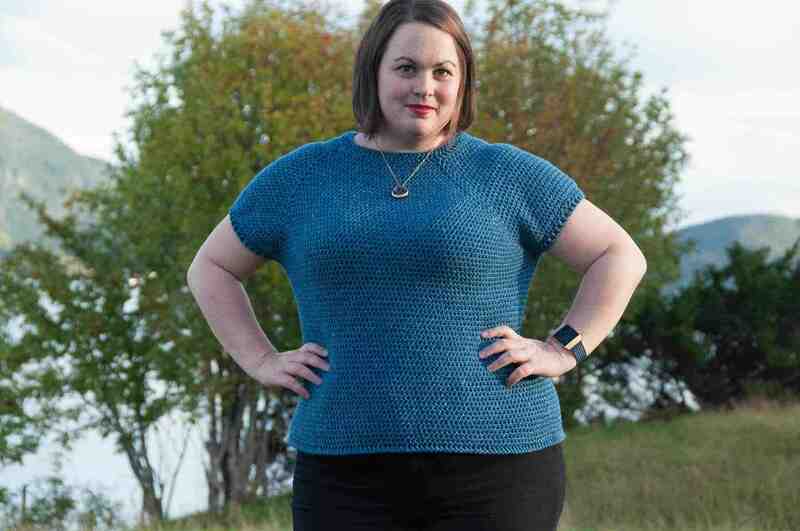 This pattern is written to have a normal fit. 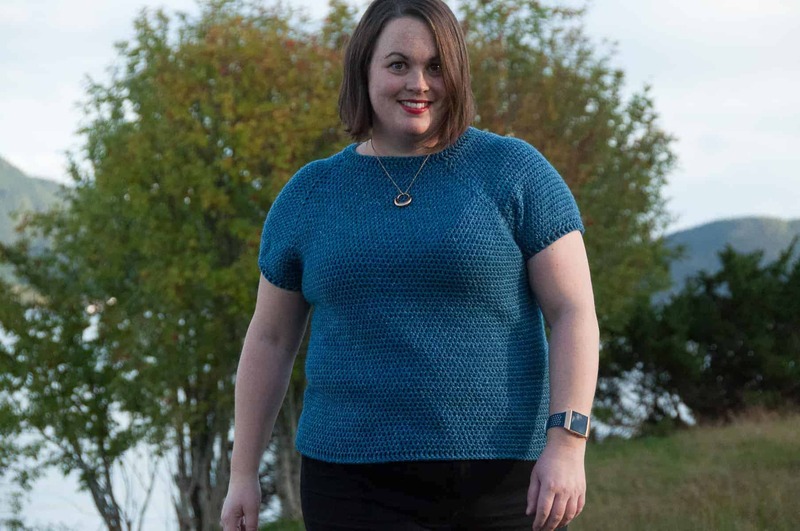 For all sizes: Best places adjust length by adding or reducing rows are: After row 4 before decreasing on row 5, or after row 44 before decreasing on row 45. 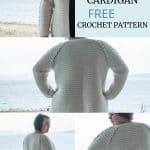 You will need to use the single crochet stitch, half double crochet stitch, double crochet stitch, treble crochet stitch, front post double crochet stitch, back post double crochet stitch, front post treble crochet stitch & back post treble crochet stitch. You’ll also need to use the cable rows & repeats, described further down. Yo, insert your hook from back to front between the prev st & the st you’re working, & bring it to the back again between the st you’re working & the next st, yo & pull up a loop, you have 3 loops on the hook, yo & pull through 2 of the 3 loops, yo and pull through the 2 last loops. Video tutorial for FPdc & BPdc. 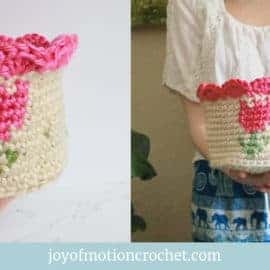 These stitches are made as regular treble crochet stitches, however either in the front post or pack post as described for the front post & back post double crochet. Yo, twice, insert your hook from front to back between the prev st & the st you’re working, & bring it to the front again between the st you’re working & the next st, yo & pull up a loop, you have 4 loops on the hook, yo & pull through 2 of the 4 loops, you have 3 loops on the hook, yo & pull through 2 of the 3 loops, yo and pull through the 2 last loops. Yo twice, insert your hook from back to front between the prev st & the st you’re working, & bring it to the back again between the st you’re working & the next st, yo & pull up a loop, you have 4 loops on the hook, yo & pull through 2 of the 4 loops, you have 3 loops on the hook, yo & pull through 2 of the 3 loops, yo and pull through the 2 last loops. Row 1 on RS: FPdc in 8 st.
Row 2 on WS: BPdc in 8 st.
Row 3 on RS: Sk 4 st, FPtr 1 in 5th st, FPtr 1 in 6st st, FPtr 1 in 7th st, FPtr 1 in 8th st, go back, FPtr 1 in 1st, FPtr 1 in 2nd st, FPtr 1 in 3rd st, FPtr 1 in 4th st.
Row 4 on WS: BPdc in 8 st, in the same order as they where made. 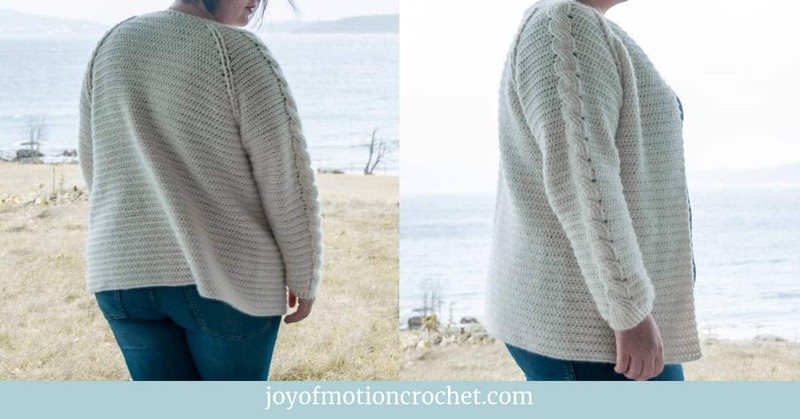 You’ll follow this rep for the 8 stitches on each side of the yoke & the middle 8 stitches on the arms, marked “cable”, starting on row 4 of the yoke. Don’t make chains to start row, turn & do a hdc directly in first st.
Row 1: Sc in 3rd ch from hook, sc 1 in all ch you just made, turn (=88 st). Row 2: Place stitch markers to mark off corners or each 2 tr you make & move stitch markers for each row. Hdc directly in 1st st (no chain), hdc 1 in next 12 st, hdc 2 in next st, tr 1 in next 2 st (place stitch marker), hdc 2 in next st, hdc 1 in next 2 st, dc 1 in next 8 st, hdc 1 in next 2 st, hdc 2 in next st, tr 1 in next 2 st (place stitch marker), hdc 2 in next st, hdc 1 in next 22 st, hdc 2 in next st, tr 1 in next 2 st (place stitch marker), hdc 2 in next st, hdc 1 in next 2 st, dc 1 in next 8 st, hdc 1 in next 2 st, hdc 2 in next st, tr 1 in next 2 st (place stitch marker), hdc 2 in next st, hdc in the next 13 st, turn (=96 st). Row 3: Hdc directly in 1st st (no chain), hdc 1 in next 13 st, hdc 2 in next st (inc), BPtr 1 in next 2 st, hdc 2 in next st (inc), hdc 1 in next 3 st, BPtr 8, hdc 1 in next 3 st, hdc 2 in next st, BPtr 1 in next 2 st, hdc 2 in next st (inc), hdc 1 in next 24 st, hdc 2 in next st (inc), BPtr 1 in next 2 st, hdc 2 in next st, hdc 1 in next 3 st, BPtr 8, hdc 1 in next 3 st, hdc 2 in next st, BPtr 1 in next 2 st , hdc 2 in next st, hdc in the next 14 st, turn (=104 st). Short description of rows 4 – 18 (20) 22 (24) 26 (28) 30 (32) 34: Rep row 3 and keep increasing 8 st each row by doing 2 hdc in 1 st before & after each marked corner. Find rows written out below. Row 4 (start cable rep on this row ): Hdc directly in 1st st (no chain), hdc 1 in next 14 st, hdc 2 in next st (inc), FPtr 1 in next 2 st, hdc 2 in next st (inc), hdc 1 in next 4 st, cable, hdc 1 in next 4 st, hdc 2 in next st, FPtr 1 in next 2 st, hdc 2 in next st (inc), hdc 1 in next 26 st, hdc 2 in next st (inc), FPtr 1 in next 2 st, hdc 2 in next st, hdc 1 in next 4 st, cable, hdc 1 in next 4 st, hdc 2 in next st, FPtr 1 in next 2 st , hdc 2 in next st, hdc in the next 15 st, turn (=112 st). Row 5: Hdc directly in 1st st (no chain), hdc 1 in next 15 st, hdc 2 in next st (inc), BPtr 1 in next 2 st, hdc 2 in next st (inc), hdc 1 in next 5 st, cable, hdc 1 in next 5 st, hdc 2 in next st, BPtr 1 in next 2 st, hdc 2 in next st (inc), hdc 1 in next 28 st, hdc 2 in next st (inc), BPtr 1 in next 2 st, hdc 2 in next st, hdc 1 in next 5 st, cable, hdc 1 in next 5 st, hdc 2 in next st, BPtr 1 in next 2 st , hdc 2 in next st, hdc in the next 16 st, turn (=120 st). Row 6: Hdc directly in 1st st (no chain), hdc 1 in next 16 st, hdc 2 in next st (inc), FPtr 1 in next 2 st, hdc 2 in next st (inc), hdc 1 in next 6 st, cable, hdc 1 in next 6 st, hdc 2 in next st, FPtr 1 in next 2 st, hdc 2 in next st (inc), hdc 1 in next 30 st, hdc 2 in next st (inc), FPtr 1 in next 2 st, hdc 2 in next st, hdc 1 in next 6 st, cable, hdc 1 in next 6 st, hdc 2 in next st, FPtr 1 in next 2 st , hdc 2 in next st, hdc in the next 17 st, turn (=128 st). Row 7: Hdc directly in 1st st (no chain), hdc 1 in next 17 st, hdc 2 in next st (inc), BPtr 1 in next 2 st, hdc 2 in next st (inc), hdc 1 in next 7 st, cable, hdc 1 in next 7 st, hdc 2 in next st, BPtr 1 in next 2 st, hdc 2 in next st (inc), hdc 1 in next 32 st, hdc 2 in next st (inc), BPtr 1 in next 2 st, hdc 2 in next st, hdc 1 in next 7 st, cable, hdc 1 in next 7 st, hdc 2 in next st, BPtr 1 in next 2 st , hdc 2 in next st, hdc in the next 18 st, turn (=136 st). Row 8: Hdc directly in 1st st (no chain), hdc 1 in next 18 st, hdc 2 in next st (inc), FPtr 1 in next 2 st, hdc 2 in next st (inc), hdc 1 in next 8 st, cable, hdc 1 in next 8 st, hdc 2 in next st, FPtr 1 in next 2 st, hdc 2 in next st (inc), hdc 1 in next 34 st, hdc 2 in next st (inc), FPtr 1 in next 2 st, hdc 2 in next st, hdc 1 in next 8 st, cable, hdc 1 in next 8 st, hdc 2 in next st, FPtr 1 in next 2 st , hdc 2 in next st, hdc in the next 19 st, turn (=144 st). Row 9: Hdc directly in 1st st (no chain), hdc 1 in next 19 st, hdc 2 in next st (inc), BPtr 1 in next 2 st, hdc 2 in next st (inc), hdc 1 in next 9 st, cable, hdc 1 in next 9 st, hdc 2 in next st, BPtr 1 in next 2 st, hdc 2 in next st (inc), hdc 1 in next 36 st, hdc 2 in next st (inc), BPtr 1 in next 2 st, hdc 2 in next st, hdc 1 in next 9 st, cable, hdc 1 in next 9 st, hdc 2 in next st, BPtr 1 in next 2 st , hdc 2 in next st, hdc in the next 20 st, turn (=152 st). Row 10: Hdc directly in 1st st (no chain), hdc 1 in next 20 st, hdc 2 in next st (inc), FPtr 1 in next 2 st, hdc 2 in next st (inc), hdc 1 in next 10 st, cable, hdc 1 in next 10 st, hdc 2 in next st, FPtr 1 in next 2 st, hdc 2 in next st (inc), hdc 1 in next 38 st, hdc 2 in next st (inc), FPtr 1 in next 2 st, hdc 2 in next st, hdc 1 in next 10 st, cable, hdc 1 in next 10 st, hdc 2 in next st, FPtr 1 in next 2 st , hdc 2 in next st, hdc in the next 21 st, turn (=160 st). Row 11: Hdc directly in 1st st (no chain), hdc 1 in next 21 st, hdc 2 in next st (inc), BPtr 1 in next 2 st, hdc 2 in next st (inc), hdc 1 in next 11 st, cable, hdc 1 in next 11 st, hdc 2 in next st, BPtr 1 in next 2 st, hdc 2 in next st (inc), hdc 1 in next 40 st, hdc 2 in next st (inc), BPtr 1 in next 2 st, hdc 2 in next st, hdc 1 in next 11 st, cable, hdc 1 in next 11 st, hdc 2 in next st, BPtr 1 in next 2 st , hdc 2 in next st, hdc in the next 22 st, turn (=168 st). Row 12: Hdc directly in 1st st (no chain), hdc 1 in next 22 st, hdc 2 in next st (inc), FPtr 1 in next 2 st, hdc 2 in next st (inc), hdc 1 in next 12 st, cable, hdc 1 in next 12 st, hdc 2 in next st, FPtr 1 in next 2 st, hdc 2 in next st (inc), hdc 1 in next 42 st, hdc 2 in next st (inc), FPtr 1 in next 2 st, hdc 2 in next st, hdc 1 in next 12 st, cable, hdc 1 in next 12 st, hdc 2 in next st, FPtr 1 in next 2 st , hdc 2 in next st, hdc in the next 23 st, turn (=176 st). Row 13: Hdc directly in 1st st (no chain), hdc 1 in next 23 st, hdc 2 in next st (inc), BPtr 1 in next 2 st, hdc 2 in next st (inc), hdc 1 in next 13 st, cable, hdc 1 in next 13 st, hdc 2 in next st, BPtr 1 in next 2 st, hdc 2 in next st (inc), hdc 1 in next 44 st, hdc 2 in next st (inc), BPtr 1 in next 2 st, hdc 2 in next st, hdc 1 in next 13 st, cable, hdc 1 in next 13 st, hdc 2 in next st, BPtr 1 in next 2 st , hdc 2 in next st, hdc in the next 24 st, turn (=184 st). Row 14: Hdc directly in 1st st (no chain), hdc 1 in next 24 st, hdc 2 in next st (inc), FPtr 1 in next 2 st, hdc 2 in next st (inc), hdc 1 in next 14 st, cable, hdc 1 in next 14 st, hdc 2 in next st, FPtr 1 in next 2 st, hdc 2 in next st (inc), hdc 1 in next 46 st, hdc 2 in next st (inc), FPtr 1 in next 2 st, hdc 2 in next st, hdc 1 in next 14 st, cable, hdc 1 in next 14 st, hdc 2 in next st, FPtr 1 in next 2 st , hdc 2 in next st, hdc in the next 25 st, turn (=192 st). Row 15: Hdc directly in 1st st (no chain), hdc 1 in next 25 st, hdc 2 in next st (inc), BPtr 1 in next 2 st, hdc 2 in next st (inc), hdc 1 in next 15 st, cable, hdc 1 in next 15 st, hdc 2 in next st, BPtr 1 in next 2 st, hdc 2 in next st (inc), hdc 1 in next 48 st, hdc 2 in next st (inc), BPtr 1 in next 2 st, hdc 2 in next st, hdc 1 in next 15 st, cable, hdc 1 in next 15 st, hdc 2 in next st, BPtr 1 in next 2 st , hdc 2 in next st, hdc in the next 26 st, turn (=200 st). Row 16: Hdc directly in 1st st (no chain), hdc 1 in next 26 st, hdc 2 in next st (inc), FPtr 1 in next 2 st, hdc 2 in next st (inc), hdc 1 in next 16 st, cable, hdc 1 in next 16 st, hdc 2 in next st, FPtr 1 in next 2 st, hdc 2 in next st (inc), hdc 1 in next 50 st, hdc 2 in next st (inc), FPtr 1 in next 2 st, hdc 2 in next st, hdc 1 in next 16 st, cable, hdc 1 in next 16 st, hdc 2 in next st, FPtr 1 in next 2 st , hdc 2 in next st, hdc in the next 27 st, turn (=208 st). Row 17: Hdc directly in 1st st (no chain), hdc 1 in next 27 st, hdc 2 in next st (inc), BPtr 1 in next 2 st, hdc 2 in next st (inc), hdc 1 in next 17 st, cable, hdc 1 in next 17 st, hdc 2 in next st, BPtr 1 in next 2 st, hdc 2 in next st (inc), hdc 1 in next 52 st, hdc 2 in next st (inc), BPtr 1 in next 2 st, hdc 2 in next st, hdc 1 in next 17 st, cable, hdc 1 in next 17 st, hdc 2 in next st, BPtr 1 in next 2 st , hdc 2 in next st, hdc in the next 28 st, turn (=216 st). Row 18: Hdc directly in 1st st (no chain), hdc 1 in next 28 st, hdc 2 in next st (inc), FPtr 1 in next 2 st, hdc 2 in next st (inc), hdc 1 in next 18 st, cable, hdc 1 in next 18 st, hdc 2 in next st, FPtr 1 in next 2 st, hdc 2 in next st (inc), hdc 1 in next 54 st, hdc 2 in next st (inc), FPtr 1 in next 2 st, hdc 2 in next st, hdc 1 in next 18 st, cable, hdc 1 in next 18 st, hdc 2 in next st, FPtr 1 in next 2 st , hdc 2 in next st, hdc in the next 29 st, turn (=224 st). Row 19: Hdc directly in 1st st (no chain), hdc 1 in next 29 st, hdc 2 in next st (inc), BPtr 1 in next 2 st, hdc 2 in next st (inc), hdc 1 in next 19 st, cable, hdc 1 in next 19 st, hdc 2 in next st, BPtr 1 in next 2 st, hdc 2 in next st (inc), hdc 1 in next 56 st, hdc 2 in next st (inc), BPtr 1 in next 2 st, hdc 2 in next st, hdc 1 in next 19 st, cable, hdc 1 in next 19 st, hdc 2 in next st, BPtr 1 in next 2 st , hdc 2 in next st, hdc in the next 30 st, turn (=232 st). Row 20: Hdc directly in 1st st (no chain), hdc 1 in next 30 st, hdc 2 in next st (inc), FPtr 1 in next 2 st, hdc 2 in next st (inc), hdc 1 in next 20 st, cable, hdc 1 in next 20 st, hdc 2 in next st, FPtr 1 in next 2 st, hdc 2 in next st (inc), hdc 1 in next 58 st, hdc 2 in next st (inc), FPtr 1 in next 2 st, hdc 2 in next st, hdc 1 in next 20 st, cable, hdc 1 in next 20 st, hdc 2 in next st, FPtr 1 in next 2 st , hdc 2 in next st, hdc in the next 31 st, turn (=240 st). Row 21: Hdc directly in 1st st (no chain), hdc 1 in next 31 st, hdc 2 in next st (inc), BPtr 1 in next 2 st, hdc 2 in next st (inc), hdc 1 in next 21 st, cable, hdc 1 in next 21 st, hdc 2 in next st, BPtr 1 in next 2 st, hdc 2 in next st (inc), hdc 1 in next 60 st, hdc 2 in next st (inc), BPtr 1 in next 2 st, hdc 2 in next st, hdc 1 in next 21 st, cable, hdc 1 in next 21 st, hdc 2 in next st, BPtr 1 in next 2 st , hdc 2 in next st, hdc in the next 32 st, turn (=248 st). Row 22: Hdc directly in 1st st (no chain), hdc 1 in next 32 st, hdc 2 in next st (inc), FPtr 1 in next 2 st, hdc 2 in next st (inc), hdc 1 in next 22 st, cable, hdc 1 in next 22 st, hdc 2 in next st, FPtr 1 in next 2 st, hdc 2 in next st (inc), hdc 1 in next 62 st, hdc 2 in next st (inc), FPtr 1 in next 2 st, hdc 2 in next st, hdc 1 in next 22 st, cable, hdc 1 in next 22 st, hdc 2 in next st, FPtr 1 in next 2 st , hdc 2 in next st, hdc in the next 33 st, turn (=256 st). Row 23: Hdc directly in 1st st (no chain), hdc 1 in next 33 st, hdc 2 in next st (inc), BPtr 1 in next 2 st, hdc 2 in next st (inc), hdc 1 in next 23 st, cable, hdc 1 in next 23 st, hdc 2 in next st, BPtr 1 in next 2 st, hdc 2 in next st (inc), hdc 1 in next 64 st, hdc 2 in next st (inc), BPtr 1 in next 2 st, hdc 2 in next st, hdc 1 in next 23 st, cable, hdc 1 in next 23 st, hdc 2 in next st, BPtr 1 in next 2 st , hdc 2 in next st, hdc in the next 34 st, turn (=264 st). Row 24: Hdc directly in 1st st (no chain), hdc 1 in next 34 st, hdc 2 in next st (inc), FPtr 1 in next 2 st, hdc 2 in next st (inc), hdc 1 in next 24 st, cable, hdc 1 in next 24 st, hdc 2 in next st, FPtr 1 in next 2 st, hdc 2 in next st (inc), hdc 1 in next 66 st, hdc 2 in next st (inc), FPtr 1 in next 2 st, hdc 2 in next st, hdc 1 in next 24 st, cable, hdc 1 in next 24 st, hdc 2 in next st, FPtr 1 in next 2 st , hdc 2 in next st, hdc in the next 35 st, turn (=272 st). Row 25: Hdc directly in 1st st (no chain), hdc 1 in next 35 st, hdc 2 in next st (inc), BPtr 1 in next 2 st, hdc 2 in next st (inc), hdc 1 in next 25 st, cable, hdc 1 in next 25 st, hdc 2 in next st, BPtr 1 in next 2 st, hdc 2 in next st (inc), hdc 1 in next 68 st, hdc 2 in next st (inc), BPtr 1 in next 2 st, hdc 2 in next st, hdc 1 in next 25 st, cable, hdc 1 in next 25 st, hdc 2 in next st, BPtr 1 in next 2 st , hdc 2 in next st, hdc in the next 36 st, turn (=280 st). Row 26: Hdc directly in 1st st (no chain), hdc 1 in next 36 st, hdc 2 in next st (inc), FPtr 1 in next 2 st, hdc 2 in next st (inc), hdc 1 in next 26 st, cable, hdc 1 in next 26 st, hdc 2 in next st, FPtr 1 in next 2 st, hdc 2 in next st (inc), hdc 1 in next 70 st, hdc 2 in next st (inc), FPtr 1 in next 2 st, hdc 2 in next st, hdc 1 in next 26 st, cable, hdc 1 in next 26 st, hdc 2 in next st, FPtr 1 in next 2 st , hdc 2 in next st, hdc in the next 37 st, turn (=288 st). Row 27: Hdc directly in 1st st (no chain), hdc 1 in next 37 st, hdc 2 in next st (inc), BPtr 1 in next 2 st, hdc 2 in next st (inc), hdc 1 in next 27 st, cable, hdc 1 in next 27 st, hdc 2 in next st, BPtr 1 in next 2 st, hdc 2 in next st (inc), hdc 1 in next 72 st, hdc 2 in next st (inc), BPtr 1 in next 2 st, hdc 2 in next st, hdc 1 in next 27 st, cable, hdc 1 in next 27 st, hdc 2 in next st, BPtr 1 in next 2 st , hdc 2 in next st, hdc in the next 38 st, turn (=296 st). Row 28: Hdc directly in 1st st (no chain), hdc 1 in next 38 st, hdc 2 in next st (inc), FPtr 1 in next 2 st, hdc 2 in next st (inc), hdc 1 in next 28 st, cable, hdc 1 in next 28 st, hdc 2 in next st, FPtr 1 in next 2 st, hdc 2 in next st (inc), hdc 1 in next 74 st, hdc 2 in next st (inc), FPtr 1 in next 2 st, hdc 2 in next st, hdc 1 in next 28 st, cable, hdc 1 in next 28 st, hdc 2 in next st, FPtr 1 in next 2 st , hdc 2 in next st, hdc in the next 39 st, turn (=304 st). Row 29: Hdc directly in 1st st (no chain), hdc 1 in next 39 st, hdc 2 in next st (inc), BPtr 1 in next 2 st, hdc 2 in next st (inc), hdc 1 in next 29 st, cable, hdc 1 in next 29 st, hdc 2 in next st, BPtr 1 in next 2 st, hdc 2 in next st (inc), hdc 1 in next 76 st, hdc 2 in next st (inc), BPtr 1 in next 2 st, hdc 2 in next st, hdc 1 in next 29 st, cable, hdc 1 in next 29 st, hdc 2 in next st, BPtr 1 in next 2 st , hdc 2 in next st, hdc in the next 40 st, turn (=312 st). Row 30: Hdc directly in 1st st (no chain), hdc 1 in next 40 st, hdc 2 in next st (inc), FPtr 1 in next 2 st, hdc 2 in next st (inc), hdc 1 in next 30 st, cable, hdc 1 in next 30 st, hdc 2 in next st, FPtr 1 in next 2 st, hdc 2 in next st (inc), hdc 1 in next 78 st, hdc 2 in next st (inc), FPtr 1 in next 2 st, hdc 2 in next st, hdc 1 in next 30 st, cable, hdc 1 in next 30 st, hdc 2 in next st, FPtr 1 in next 2 st , hdc 2 in next st, hdc in the next 41 st, turn (=320 st). Row 31: Hdc directly in 1st st (no chain), hdc 1 in next 41 st, hdc 2 in next st (inc), BPtr 1 in next 2 st, hdc 2 in next st (inc), hdc 1 in next 31 st, cable, hdc 1 in next 31 st, hdc 2 in next st, BPtr 1 in next 2 st, hdc 2 in next st (inc), hdc 1 in next 80 st, hdc 2 in next st (inc), BPtr 1 in next 2 st, hdc 2 in next st, hdc 1 in next 31 st, cable, hdc 1 in next 31 st, hdc 2 in next st, BPtr 1 in next 2 st , hdc 2 in next st, hdc in the next 42 st, turn (=328 st). Row 32: Hdc directly in 1st st (no chain), hdc 1 in next 42 st, hdc 2 in next st (inc), FPtr 1 in next 2 st, hdc 2 in next st (inc), hdc 1 in next 32 st, cable, hdc 1 in next 32 st, hdc 2 in next st, FPtr 1 in next 2 st, hdc 2 in next st (inc), hdc 1 in next 82 st, hdc 2 in next st (inc), FPtr 1 in next 2 st, hdc 2 in next st, hdc 1 in next 32 st, cable, hdc 1 in next 32 st, hdc 2 in next st, FPtr 1 in next 2 st , hdc 2 in next st, hdc in the next 43 st, turn (=336 st). Row 33: Hdc directly in 1st st (no chain), hdc 1 in next 43 st, hdc 2 in next st (inc), BPtr 1 in next 2 st, hdc 2 in next st (inc), hdc 1 in next 33 st, cable, hdc 1 in next 33 st, hdc 2 in next st, BPtr 1 in next 2 st, hdc 2 in next st (inc), hdc 1 in next 84 st, hdc 2 in next st (inc), BPtr 1 in next 2 st, hdc 2 in next st, hdc 1 in next 33 st, cable, hdc 1 in next 33 st, hdc 2 in next st, BPtr 1 in next 2 st , hdc 2 in next st, hdc in the next 44 st, turn (=344 st). Row 34: Hdc directly in 1st st (no chain), hdc 1 in next 44 st, hdc 2 in next st (inc), FPtr 1 in next 2 st, hdc 2 in next st (inc), hdc 1 in next 34 st, cable, hdc 1 in next 34 st, hdc 2 in next st, FPtr 1 in next 2 st, hdc 2 in next st (inc), hdc 1 in next 86 st, hdc 2 in next st (inc), FPtr 1 in next 2 st, hdc 2 in next st, hdc 1 in next 34 st, cable, hdc 1 in next 34 st, hdc 2 in next st, FPtr 1 in next 2 st , hdc 2 in next st, hdc in the next 45 st, turn (=352 st). No need to fasten thread. 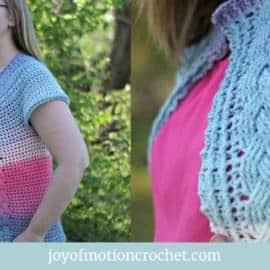 You can cont with the same yarn on the body. 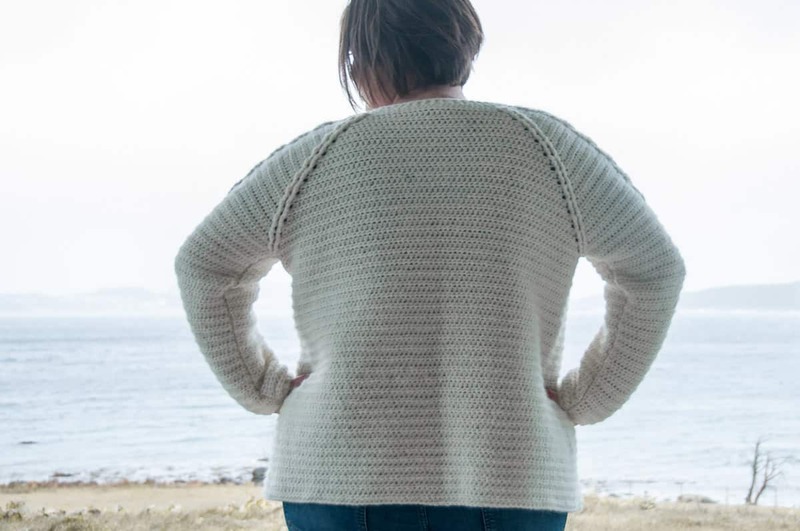 Cont where you left off for the last row of the yoke. Row 1: Hdc directly in 1st st (no chain), hdc in each st until you reach the first FPtr from prev row & hdc in it, cont directly with hdc in 2nd FPtr from the closest back corner, hdc in all st from the back until you reach the first FPtr from prev row & hdc in it, cont diretly to the 2nd FPtr from the front corner you haven’t crocheted in, hdc in remaining st (= 124 (132) 140 (148) 156 (164) 172 (180) 188 st). Row 2 – 55: Hdc directly in 1st st, hdc 1 in each st from prev row, turn (= 124 (132) 140 (148) 156 (164) 172 (180) 188 st). *see “Size & Measurements” for size adjustments. Attach thread to row 1 on the yoke. 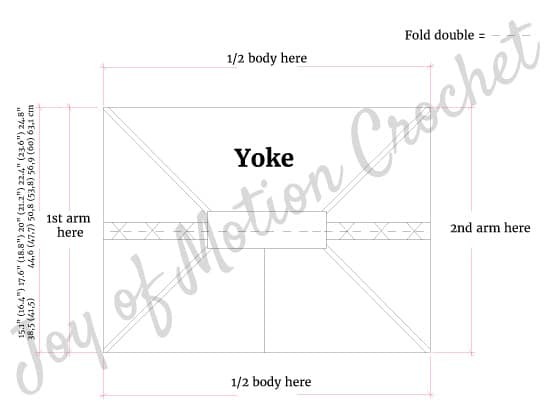 Row 1: Hdc2tog directly in 1st & 2nd st, hdc2tog in the next 88 hdc st from row 1 of the yoke, (= 44 st). Row 2: Hdc directly in 1st st, BPdc 1 in all st from prev row until you have 1 st left, hdc 1 in last st, (= 44 st). Row 3: Hdc directly in 1st st, FPdc 1 in all st from prev row until you have 1 st left, hdc 1 in last st, (= 44 st). 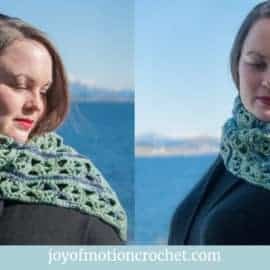 Attach thread to the FPtr at the beg of short side of the yoke with a slip st, in the corner so you can crochet on the RS. Row 1 – 4: Hdc directly in 1st st (no chain), hdc 1 in the next 20 (22) 24 (26) 28 (30) 32 (34) 36 hdc st from prev row, cable, hdc 1 in the next 21 (23) 25 (27) 29 (31) 33 (35) 37 st, turn (= 50 (54) 58 (62) 66 (70) 74 (78) 82 st). Row 5: Hdc2tog directly in 1st & 2nd st (no chain), hdc 1 in the next 19 (21) 23 (25) 27 (29) 31 (33) 35 hdc st from prev row, cable, hdc 1 in the next 19 (21) 23 (25) 27 (29) 31 (33) 35 hdc st from prev row, hdc2tog in the last 2 st, turn (= 48 (52) 56 (60) 64 (68) 72 (76) 80 st). Row 6 – 8: Hdc directly in 1st st (no chain), hdc 1 in the next 19 (21) 23 (25) 27 (29) 31 (33) 35 hdc st from prev row, cable, hdc 1 in the next 20 (22) 24 (26) 28 (30) 32 (34) 36 st, turn (= 50 (54) 58 (62) 66 (70) 74 (78) 82 st). Short description of rows 9-44 Rep row 5-8, and keep decreasing 2 st each 4th row by crocheting hdc2tog on the beg & end of every 4th row. Find rows written out below. Row 9: Hdc2tog directly in 1st & 2nd st (no chain), hdc 1 in the next 18 (20) 22 (24) 26 (28) 30 (32) 34 hdc st from prev row, cable, hdc 1 in the next 18 (20) 22 (24) 26 (28) 30 (32) 34 hdc st from prev row, hdc2tog in the last 2 st, turn (= 46 (50) 54 (58) 62 (66) 70 (74) 78 st). Row 10 – 12: Hdc directly in 1st st (no chain), hdc 1 in the next 18 (20) 22 (24) 26 (28) 30 (32) 34 hdc st from prev row, cable, hdc 1 in the next 19 (21) 23 (25) 27 (29) 31 (33) 35 st, turn (= 46 (50) 54 (58) 62 (66) 70 (74) 78 st). Row 13: Hdc2tog directly in 1st & 2nd st (no chain), hdc 1 in the next 17 (19) 21 (23) 25 (27) 29 (31) 33 hdc st from prev row, cable, hdc 1 in the next 17 (19) 21 (23) 25 (27) 29 (31) 33 hdc st from prev row, hdc2tog in the last 2 st, turn (= 44 (48) 52 (56) 60 (64) 68 (72) 76 st). Row 14 – 16: Hdc directly in 1st st (no chain), hdc 1 in the next 17 (19) 21 (23) 25 (27) 29 (31) 33 hdc st from prev row, cable, hdc 1 in the next 18 (20) 22 (24) 26 (28) 30 (32) 34 st, turn (= 44 (48) 52 (56) 60 (64) 68 (72) 76 st). Row 17: Hdc2tog directly in 1st & 2nd st (no chain), hdc 1 in the next 16 (18) 20 (22) 24 (26) 28 (30) 32 hdc st from prev row, cable, hdc 1 in the next 16 (18) 20 (22) 24 (26) 28 (30) 32 hdc st from prev row, hdc2tog in the last 2 st, turn (= 42 (46) 50 (54) 58 (62) 66 (70) 74 st). Row 18 – 20: Hdc directly in 1st st (no chain), hdc 1 in the next 16 (18) 20 (22) 24 (26) 28 (30) 32 hdc st from prev row, cable, hdc 1 in the next 17 (19) 21 (23) 25 (27) 29 (31) 33 st, turn (= 42 (46) 50 (54) 58 (62) 66 (70) 74 st). Row 21: Hdc2tog directly in 1st & 2nd st (no chain), hdc 1 in the next 15 (17) 19 (21) 23 (25) 27 (29) 31 hdc st from prev row, cable, hdc 1 in the next 15 (17) 19 (21) 23 (25) 27 (29) 31 hdc st from prev row, hdc2tog in the last 2 st, turn (= 40 (44) 48 (52) 56 (60) 64 (68) 72 st). Row 22 – 24: Hdc directly in 1st st (no chain), hdc 1 in the next 15 (17) 19 (21) 23 (25) 27 (29) 31 hdc st from prev row, cable, hdc 1 in the next 16 (18) 20 (22) 24 (26) 28 (30) 32 st, turn (= 40 (44) 48 (52) 56 (60) 64 (68) 72 st). Row 25: Hdc2tog directly in 1st & 2nd st (no chain), hdc 1 in the next 14 (16) 18 (20) 22 (24) 26 (28) 30 hdc st from prev row, cable, hdc 1 in the next 14 (16) 18 (20) 22 (24) 26 (28) 30 hdc st from prev row, hdc2tog in the last 2 st, turn (= 38 (42) 46 (50) 54 (58) 62 (66) 70 st). Row 26 – 28: Hdc directly in 1st st (no chain), hdc 1 in the next 14 (16) 18 (20) 22 (24) 26 (28) 30 hdc st from prev row, cable, hdc 1 in the next 15 (17) 19 (21) 23 (25) 27 (29) 31 st, turn (= 38 (42) 46 (50) 54 (58) 62 (66) 70 st). Row 29: Hdc2tog directly in 1st & 2nd st (no chain), hdc 1 in the next 13 (15) 17 (19) 21 (23) 25 (27) 29 hdc st from prev row, cable, hdc 1 in the next 13 (15) 17 (19) 21 (23) 25 (27) 29 hdc st from prev row, hdc2tog in the last 2 st, turn (= 36 (40) 44 (48) 52 (56) 60 (64) 68 st). Row 30 – 32: Hdc directly in 1st st (no chain), hdc 1 in the next 13 (15) 17 (19) 21 (23) 25 (27) 29 hdc st from prev row, cable, hdc 1 in the next 14 (16) 18 (20) 22 (24) 26 (28) 30 st, turn (= 36 (40) 44 (48) 52 (56) 60 (64) 68 st). Row 33: Hdc2tog directly in 1st & 2nd st (no chain), hdc 1 in the next 12 (14) 16 (18) 20 (22) 24 (26) 28 hdc st from prev row, cable, hdc 1 in the next 12 (14) 16 (18) 20 (22) 24 (26) 28 hdc st from prev row, hdc2tog in the last 2 st, turn (= 34 (38) 42 (46) 50 (54) 58 (62) 66 st). Row 34 – 36: Hdc directly in 1st st (no chain), hdc 1 in the next 12 (14) 16 (18) 20 (22) 24 (26) 28 hdc st from prev row, cable, hdc 1 in the next 13 (15) 17 (19) 21 (23) 25 (27) 29 st, turn (= 34 (38) 42 (46) 50 (54) 58 (62) 66 st). Row 37: Hdc2tog directly in 1st & 2nd st (no chain), hdc 1 in the next 11 (13) 15 (17) 19 (21) 23 (25) 27 hdc st from prev row, cable, hdc 1 in the next 11 (13) 15 (17) 19 (21) 23 (25) 27 hdc st from prev row, hdc2tog in the last 2 st, turn (= 32 (36) 40 (44) 48 (52) 56 (60) 64 st). Row 38 – 40: Hdc directly in 1st st (no chain), hdc 1 in the next 11 (13) 15 (17) 19 (21) 23 (25) 27 hdc st from prev row, cable, hdc 1 in the next 12 (14) 16 (18) 20 (22) 24 (26) 28 st, turn (= 32 (36) 40 (44) 48 (52) 56 (60) 64 st). Row 41: Hdc2tog directly in 1st & 2nd st (no chain), hdc 1 in the next 10 (12) 14 (16) 18 (20) 22 (24) 26 hdc st from prev row, cable, hdc 1 in the next 10 (12) 14 (16) 18 (20) 22 (24) 26 hdc st from prev row, hdc2tog in the last 2 st, turn (= 30 (34) 38 (42) 46 (50) 54 (58) 62 st). Row 42 – 44: Hdc directly in 1st st (no chain), hdc 1 in the next 10 (12) 14 (16) 18 (20) 22 (24) 26 hdc st from prev row, cable, hdc 1 in the next 11 (13) 15 (17) 19 (21) 23 (25) 27 st, turn (= 30 (34) 38 (42) 46 (50) 54 (58) 62 st). After this you’ll not make cable crosses, just FPdc or BPDC correspondingly to where you did cable before. Row 45: Hdc directly in 1st st, hdc2tog in the next 10 (12) 14 (16) 18 (20) 22 (24) 26 hdc st from prev row, FPdc/BPdc 8, hdc2tog in the next 10 (12) 14 (16) 18 (20) 22 (24) 26 hdc st from prev row, hdc 1 in last st, (= 20 (22) 24 (26) 28 (30) 32 (34) 36 st). Row 46: Hdc directly in 1st st, FPdc/BPdc 1 in all st from prev row until you have 1 st left, hdc 1 in last st, (= 20 (22) 24 (26) 28 (30) 32 (34) 36 st). Row 47: Hdc directly in 1st st, FPdc/BPdc 1 in all st from prev row until you have 1 st left, hdc 1 in last st, (= 20 (22) 24 (26) 28 (30) 32 (34) 36 st). 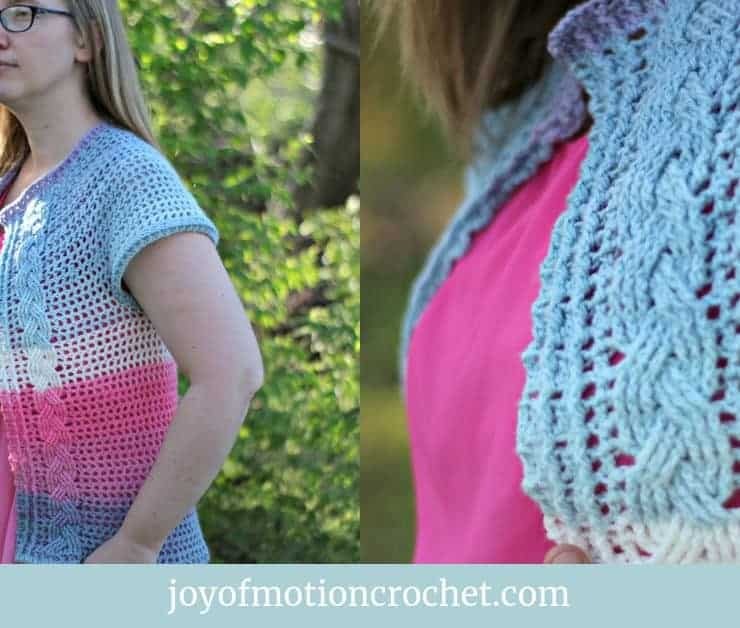 I really hope you liked the crochet Nivis Cardigan! 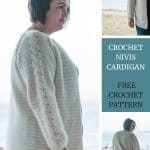 However, if you really like it, make sure to share the FREE pattern & share pictures of your crochet Nivis Cardigan that you’ve made with me. 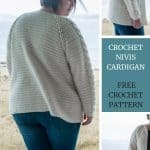 Share your finished crochet Nivis Cardigan on Love Crochet. 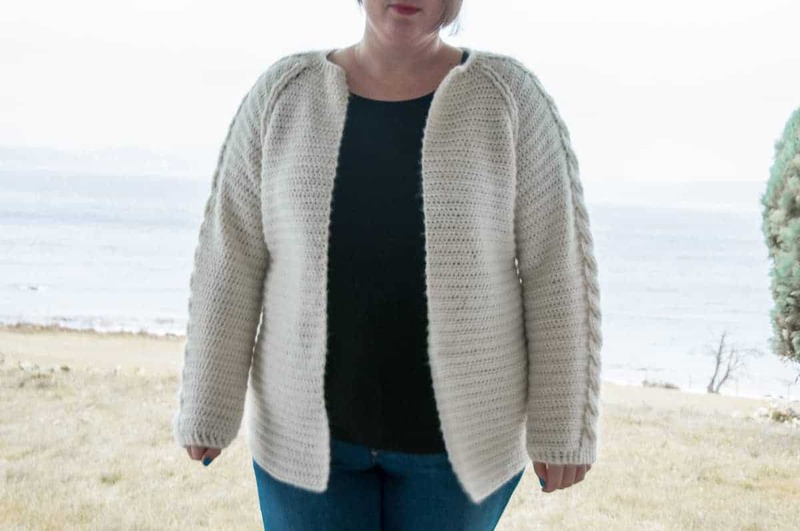 Share your finished crochet Nivis Cardigan on Ravelry. 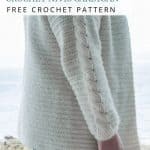 Love the cable stitches down the sleeve. Very unique. Thanks so much. Love this. Can’t wait to make it. 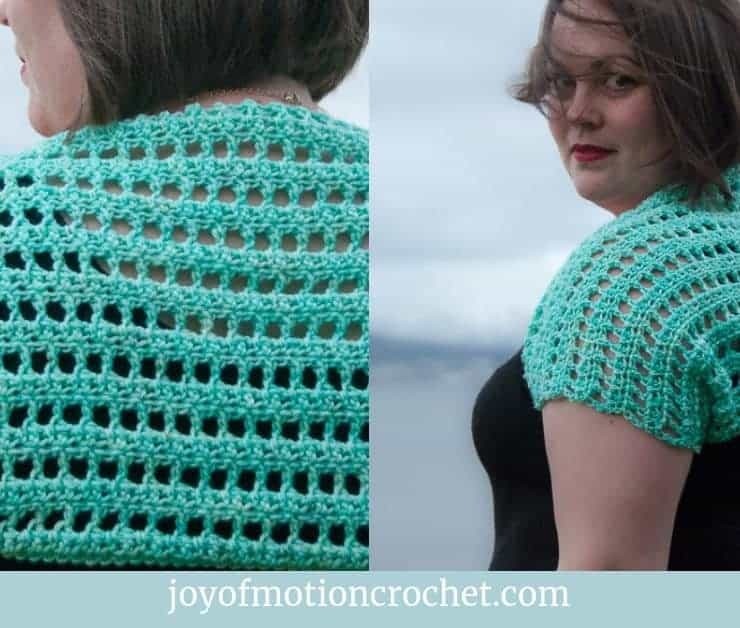 This is the first of your patterns I have ever seen. Though it is not something I think I will make, the amount of detail that went into the writing of this post is greatly appreciated. Wow! 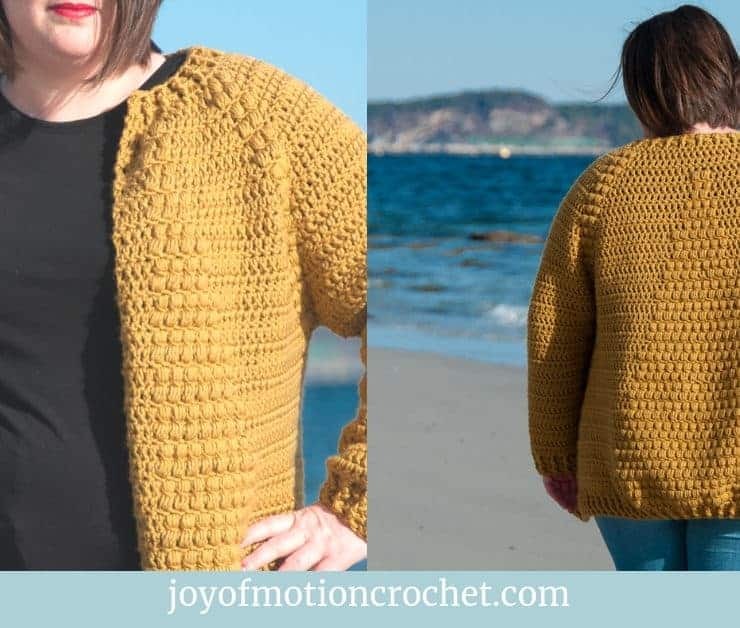 I don’t think I have ever seen a pattern that tells you so much about the yarn in case you need to use a different one or about how to adjust the size of it. Alisa, thank you so much for your compliment!